Now here's an iced tea with quite a twist. It's C-Ice Swiss Cannabis Ice Tea. The ingredients for this one are "water, hemp bloom syrup (5 %), sugar, lemon juice, black tea extract (0.14 %) antioxidant, ascorbic acid, flavour, hemp bloom extract (0.0015 %)". I'm not sure what else to say about this brew. I guess this is my cue to wax witty, but I seem to be coming up dry at the moment. 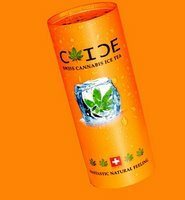 Anyway, according to the Strange Products Web site, where I first ran across this product, C-Ice is not available in the United States. No surprise there, I guess.